It was mid-September and quite warm as we left the ramp and headed out to catch bait, which is my normal pattern in the summer time. As I idled up to my bait spot, I was glad to see a big wad of bait peppered up on top on the edge of the flat as the tide was falling. I also saw a couple of boils in the bait. Time for a Rapala plug! “Hey guys, let’s make a couple of casts before I toss the net” I said to my anglers, handing them a light spinning outfit rigged up with a small Rapala plug. Candice make a good cast and on the third pause, the water exploded and the line peeled off the drag; no need for a hook set, the fish took care of that! The fish leapt clear of the water, shaking it’s head angrily and revealing itself to be a snook. A few minutes later it came alongside the boat, posed for a quick picture, and then gently released. 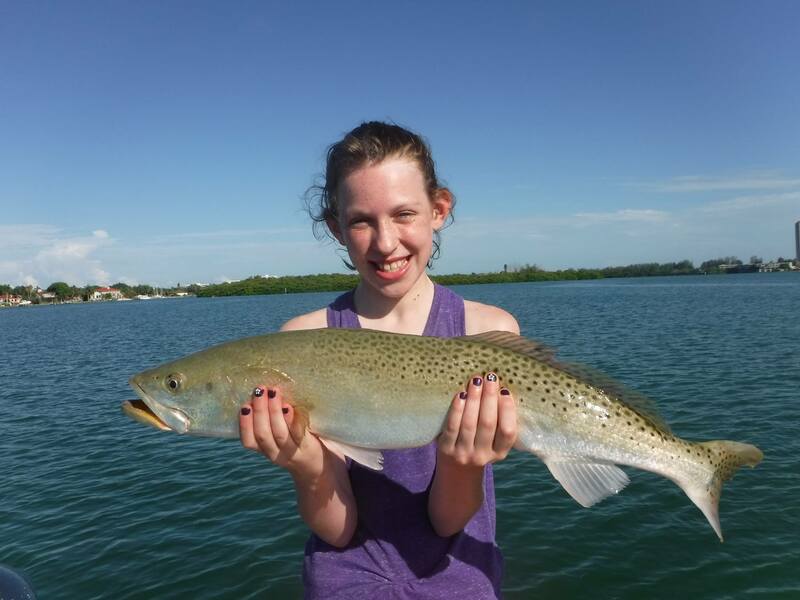 It was not a big fish, but great sport on light tackle and Candice was plenty proud of it! Before the morning was over, Spanish mackerel, speckled trout, jack crevelle, and a gag grouper fell prey to one of my favorite artificial baits, the Rapala plug. As autumn arrives here on Florida’s Suncoast, fishing patterns change and successful anglers will adapt as well. Cooling water temperatures will bring in schools of glass minnows, smaller white bait, and finger mullet into the estuaries and inshore Gulf of Mexico. Smaller lures that match the smaller forage will produce both good numbers of fish along with some of quality size. Casting a Rapala plug is one of my favorite methods to catch fish and I try and keep at least one rod on the boat rigged up with one. I enjoy the challenge of casting to shoreline cover, the anticipation, and then the satisfaction of an explosive strike! There are many lure manufacturers that produce quality baits. The one bait that I have found to be the most productive over my 25 years of guiding is the (08) Rapala X-Rap slashbait. That bait is the perfect size to imitate the typical forage in the cooler months, casts well, and has strong enough hooks to hold a large fish. Olive is my “go to” color, with white a close second. Gold is my favorite color in tannin or stained water. I use the same rig in most circumstances; double 4 feet of line using a Spider Hitch, then attach 30” of 30 pound fluorocarbon leader. Lastly, I tie on the plug using a Uni-Knot. I seldom, if ever, use wire leader, finding that the number of strikes is greatly reduced while experiencing very few cut-offs from mackerel and bluefish. As a full time Siesta Key fishing guide I really appreciate how incredibly versatile these little lures are, along with them being easy for a novice angler to use effectively. I use a Rapala plug quite often in several different situations when fishing the open grass flats. Schools of baitfish will cover shallow grass bars, particularly on the higher tide stages. Most small plugs float at rest then dive several feet below the surface. Casting it out and reeling it back in with an erratic “twitch and pause” retrieve will elicit some explosive strikes! Snook, redfish, speckled trout, and jack crevelle will fall prey to a well-presented plug. A Rapala plug can also be deadly when fished over the deeper grass flats, particularly when there is some surface activity such as birds diving and fish breaking on top. Gamefish that are actively feeding in the upper portion of the water column will readily take a fast moving, erratically retrieved plug. Once again, the bait that they will be feeding on will be on the smaller side, making these smaller plugs a great choice. Trolling these same plugs can be an extremely effective technique when the fish are not showing well or are scattered out and moving around. Simply let out 1/3 of the line off the reel and idle around until the fish are located. Often times after I finish a drift and am idling back around to my starting point I will drag a plug out behind the boat. This works very well on Spanish mackerel, bluefish, ladyfish, and other species as well. 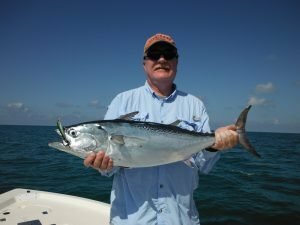 In the fall, world class angling can occur just off the west coast beaches in the Gulf of Mexico. As the weather patterns change, east winds dominate and the water cools off and clears up. This draws in huge schools of baitfish, which in term attracts the predators. False albacore (locally referred to as “bonita”) are one of the fiercest gamefish that an angler can catch on light spinning tackle. At times they can be very fussy; randomly moving quickly from place to place, refusing most offerings as they are keyed in to small glass minnows. I have found that the small X-Rap shines in this situation, getting bit when nothing else will. Spanish mackerel seldom refuse one as well when they are feeding actively on the surface. As with the inshore fishing, trolling can be productive when the surface action is absent. As the water cools off, snook begin their migration up into creeks, rivers, and residential canals. A small Rapala plug realistically mimic finger mullet and other small baitfish that snook and jacks feed on. In developed areas, docks will be the primary cover. Anglers should move along on the trolling motor, casting to likely looking spots in search of a strike. Again, giving the lure a sharp twitch with a pause in between is usually the most productive retrieve. The ability to cover a lot of water quickly and effectively will increase success, and plugs are perfect for that. Plugs run just a few feet below the surface as well, avoiding hang-ups on submerged brush and structure. Trolling also works well in creeks and rivers in the cooler months, though it does not seem like snook will be right out in the middle. These waters tend to have an undulating bottom with sharp drop-offs. Snook and jacks will use these ledges to get out of the current and ambush prey. So, the next time that you are out on the water, give these diminutive baits a chance, you may end up being as impressed with them as I am!